I’ve never been one for cars, even when I passed my test at seventeen my main consideration was would it get me where I wanted to and back. Back then it was mostly work and the water’s edge and all these years later nothing has changed. To highlight just how unimportant image is to me as far as cars are concerned, up until two weeks ago I owned a Perodua Myvi. It didn’t turn many heads – in fact none to be precise – but it was very reliable and that was the main box to tick. However, wanting to stay ahead while the car was performing well, I part-exchanged it for an MG 3 which suits me down to the ground. It’s a step-up from the 1.0 litre engine of the Perodua to a 1.5 which as I’m now doing 2,000 miles plus per month is better. Plus I’ve got hands-free for telephone calls and bluetooth for my music. I’m still not one for cars but this one again ticks the boxes. Also, for the first time I’ve got a private number plate. It all started when I was chatting to one of our players at TNS, Ryan Leak, who is on loan from Wolverhampton Wanderers. He’s got a personal plate and he said I should get one with REV on. I said no, it’s not for me, but then later while surfing the internet I thought I’d check out the DVLA out of curiosity. Aside from the extremely unique plates that are incredibly expensive, the basic ones are not too bad. I typed in REV just out of interest and then when I came across SB62 REV – my initials and year of birth as well as the fact that I really am an ordained minister – I slept on it then a few days later took the plunge. I decided to add the Welsh flag as well to the plate. Although I’m proud to be English, I love my Welsh heritage. The two sit very comfortably with me side-by-side. What swayed y ddraig goch (the red dragon) though was the fact that I’m working in Welsh football, which is the main reason I’m doing so many miles each month. With the water temperatures being quite low this week I decided to fish mostly a static bait. With just two micro-jigging sessions that drew blanks, the eight with the Poachers Pocket set-up were far more productive. My usual approach of 4lb mainline, 1/3 ounce lead and a small shot and 5mm bead creating a hooklength of 2.5 lb fluorocarbon served me well. Bait was a single red maggot on a Drennan Super Specialist hook and I fed loose maggots, rather sparingly due to the conditions. You can always put more bait in if needed but once out there you can’t take it back. I fished mostly canals with three visits to a brook. 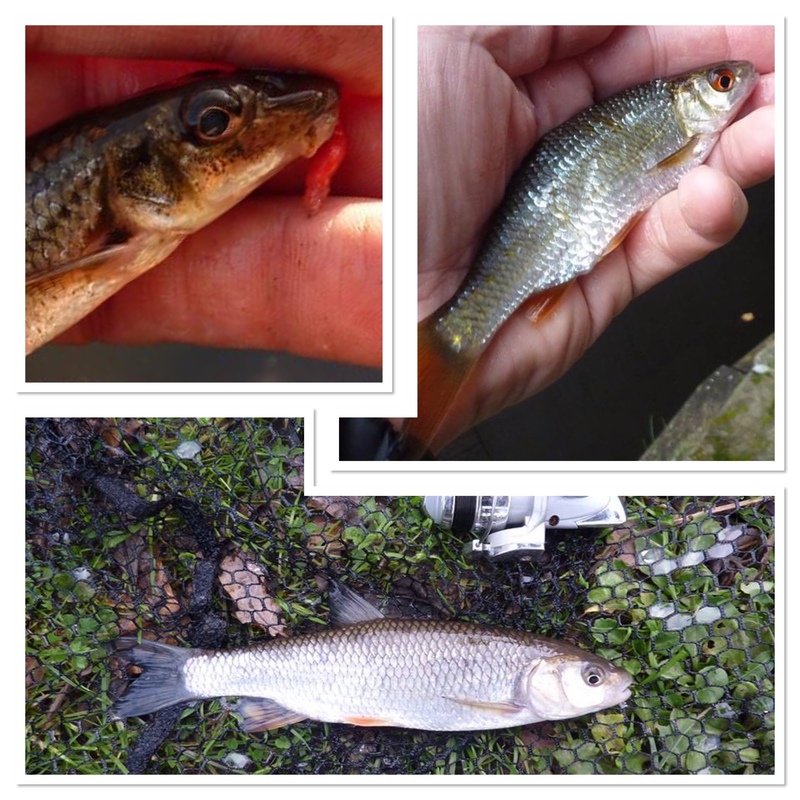 The latter produced roach while the former saw more variety with chub, gudgeon, perch and roach on the bank. As well as the photos on this page there are some in the video as well. 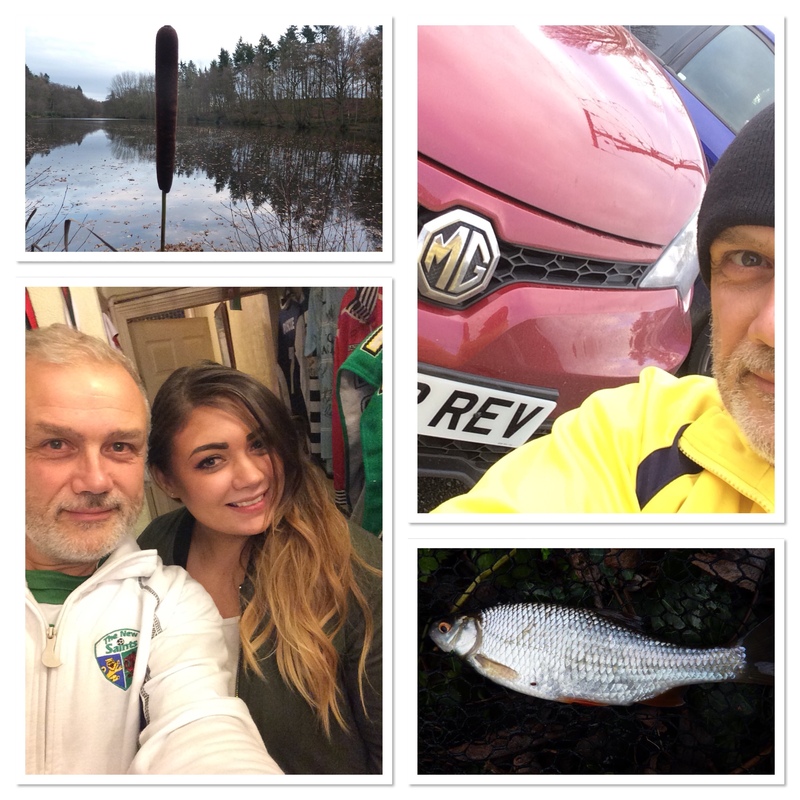 Nothing big this week but taking into account the conditions, it was good just to catch. In addition, apart from one outing and more of that below, the trips were very short. That’s the beauty of the Poachers Pocket rod and reel though. It fits very well into the lifestyle that I have. Without it, I wouldn’t be doing anywhere near the number of sessions I do. All in all, I managed eleven this week which takes me 363 for the year so far. I’m on track for the target of 400 I set myself at the start of 2017, although we will have to see what happens over the next few weeks as snow could well prove to be an issue. Not for the actual fishing itself, as I love angling in the snow, but access to and from the water’s edge. I also managed one longer session this week, pursuing carp in the county of Shropshire. Fishing the Seggy Pool on the Kinver Freeliners ticket, I was very confident, as I always am when I go there. It’s my favourite winter carp venue and I always catch. Well, I can’t say that any more as I failed to get any action at all. Normally the feeding fish give themselves away by the bubbles they produce as they root around on the bottom. However, the lake was a piscatorial graveyard on this occasion. Fishing with SBS boilies I was more than confident in my bait but sometimes these things happen. I even took my camcorder to capture some action but the only filming I did was the common buzzard and mute swans that you can see in this week’s video. I’ll certainly be back though, looking to get back on track with that venue. I’m enjoying my short sessions with the jigging or Poachers Pocket set-ups but it’s nice to do some ‘proper’ fishing as well. This week it’s Small Stream Reflections. I have been adding new blogs beginning with the letter S this week and randomly searching the internet and adding any that fitted the description I came across this. I don’t even know the name of the author as I can’t see anywhere on the site that mentions who it is. He lives in the USA and, as the name of the blog suggests, fishes small streams. Not much text but some great shots. I also love small streams myself, in fact I’ve been doing some brook angling in the last year or so since I ‘discovered’ a place that has been pulling me back ever since. Finally, as always, here are a few selected posts from my Facebook account. All my posts are public and as as such I’m happy to add anyone who sends me a friend request. So feel free.